In the past, having a successful experience with Hawaiian by In4mation, Casio has presented joint projects. 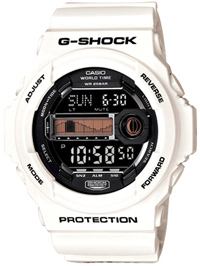 At this time, the company once again teamed up to produce new items – watches G-Shock GLX-150X-7JR. The technology, as noted by the company – part of the sports watch collection G-LIDE, which is a special feature of the sensor, indexing and tides, moon phases, as well as a pretty impressive display water resistance – up to 200 meters. In addition to these features, the new hours, you can add an alarm function, a digital compass, world time display in 48 cities around the world. To all this add reliable shock protection – and you get an excellent multifunctional sports and reliable model. As for the design of new items, it should be noted that the watch Casio G-Shock GLX-150X-7JR different from previous models is quite understated design that does not allow more immediately appreciate its functionality and practicality. However, low-key hours still have a small eye-catching element – the holder on the strap, bright red color saturation. Opening presents on a white strap, decorated with printed patterns. Dial model – black. Also note that the dial illuminates fairly bright LED lights: Another plus, in the treasury of the practicality of a new sports model. Buy Watches Casio G-Shock GLX-150X-7JR available through our authorized representatives of the company in a special box attached to each model, with printed patterns.